I have invited a few friends and acquaintances to accompany us. If I’m going to suffer, everyone else is going to suffer too. We are all packed, I have dosed Benno and Fisi with Dramamine, and I guess there is nothing left to do but drive. Note the time. Note also that it is a whole hour earlier where we are headed because this state is so indecently huge that it can’t be squashed into a single time zone. Unbelievable. When I rule the world I will tidy this mess up. The scenery has been rather same-ish for the first several HUNDRED miles. Tree, farm, cow, field, truck, truck, giant metal rooster. (Don’t ask me. It is, apparently, a thing.) We have now encountered a few hills, and there are some odd goats that are all white with brown or black heads. I’m sure there is a story behind that. (Actually, it looks like the sort of livestock joke I would play.) The vegetation is a little scrubbier and the road a little more wind-y, but otherwise, yawn. We have how many more hours of this? The human female has been driving all this time (I’m always amazed that the Department of Public Safety lets her loose on the highway) and now it is time for a stop. I am given to understand that the roadside establishments in this realm have a “charm” all their own. 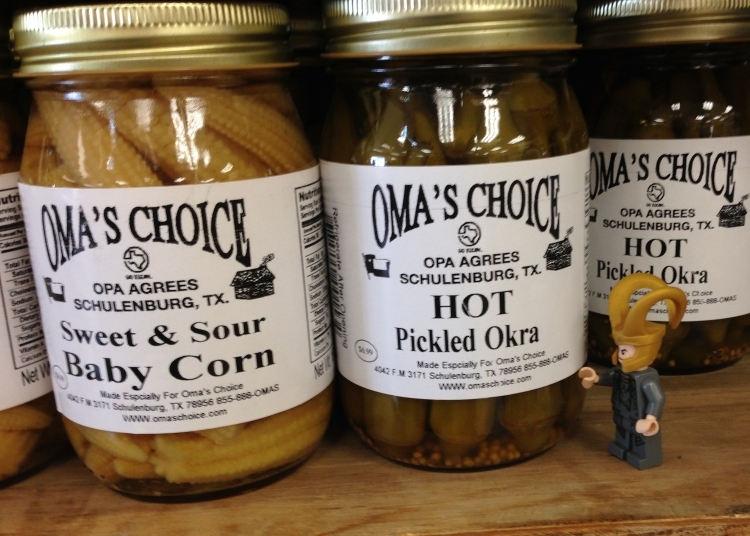 I shall attempt to alleviate some of my boredom on this trip by examining some of the wares and comestibles for sale. Sigyn? Do you know what “deer corn” is? I have tried plain popcorn, and I know that caramel corn is quite popular. I guess this is a venison-flavored snack? That’s not the worst snack idea I’ve ever heard of, but why would anyone want thirty pounds of it? We are eating a lunch that the human female packed, so as not to “lose too much time” dining at a restaurant. 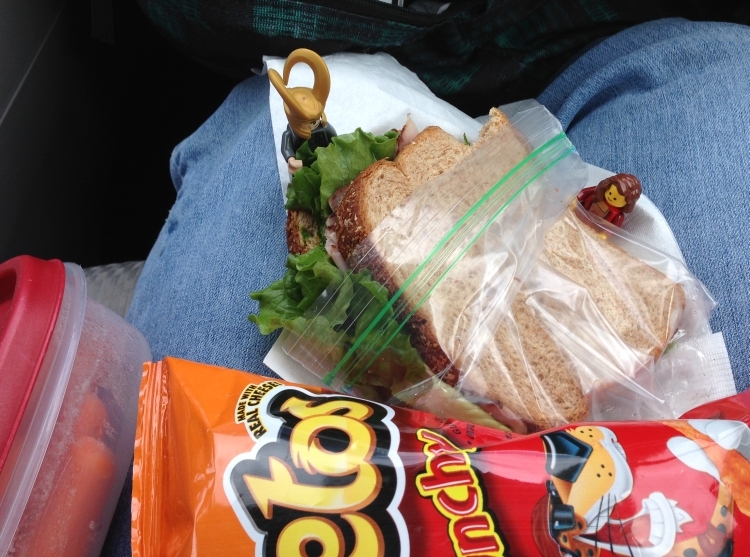 Mmmm–there is nothing quite like juggling a beverage, a sandwich, small root vegetables, and other crunchy orange things in a moving vehicle. Not to mention that these particular crunchy orange things are preternaturally messy and addictive. 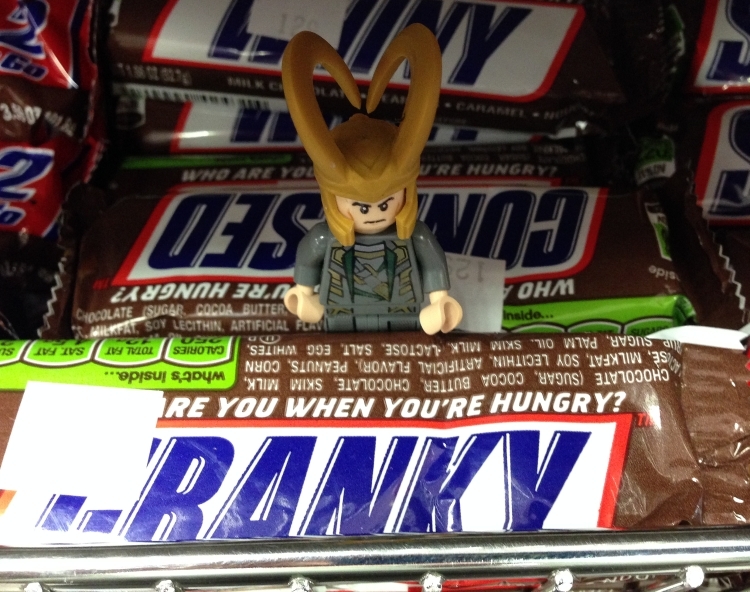 Sigyn, my love, it pains me to remind you that aren’t allowed to go near them. We’ve barely got you cleaned up from the last time. I think there are some pretzels in the bag in the back seat. Those should be safe. Later. By Odin’s crummy depth perception! This isn’t our destination?! Sadly, no. This hamlet is called “Junction.” The human female says that is because this is where Nowhere meets Boonies, and I’m inclined to believe her. Let’s see what’s on offer here. ¡Muy delicioso! There are many sorts of small cakes labeled in Spanish. Some of them look tasty, but rather than choose the first thing I see, I shall keep looking, in case there is something better a little further on. 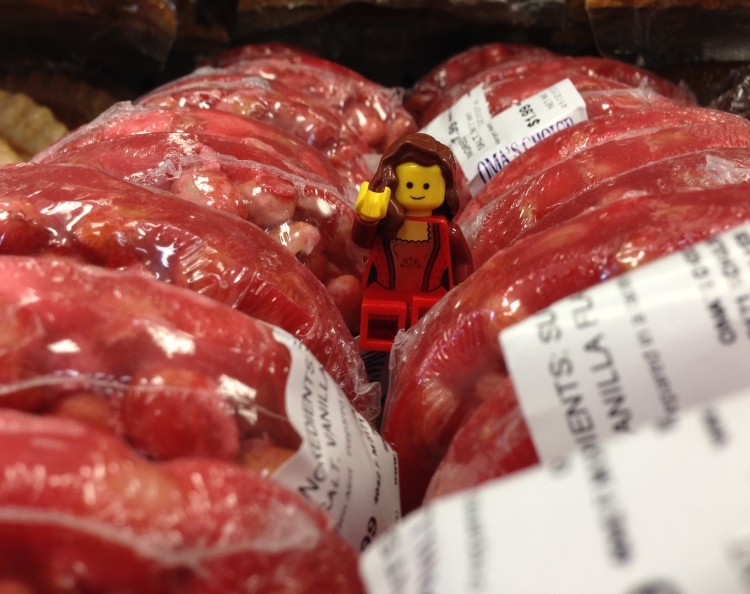 Sigyn has found something red that looks to be sweet and a little nutty. Like calls to like, as they say. Hours later and we are now just half way. Outside are flat-topped small mountains that the human female says used to stick up out of a huge inland sea. Now all that is left are rocks, sand, cactus and other prickly plants, and another 360 miles of asphalt. I feel a desperate need to jump out and stretch my legs. And maybe scream a bit. This is Ozona. Or maybe it’s not. 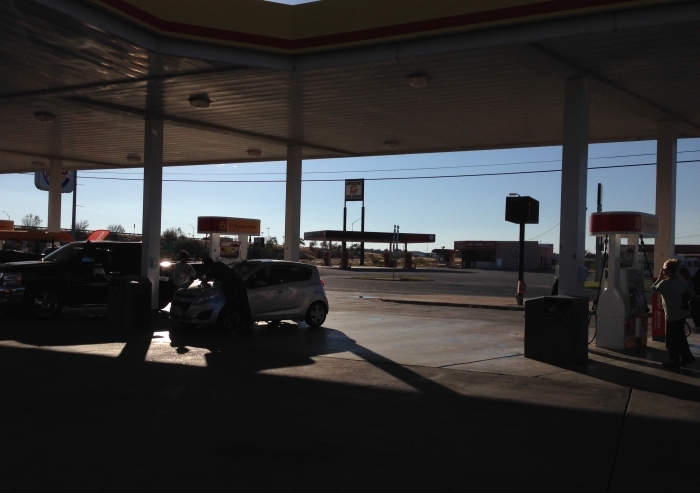 One West Texas town is much like the next and I am losing track. The humans are navigating from memory and Yelp is asleep on the map. Let us see what gastronomical delights await inside. Ooo. 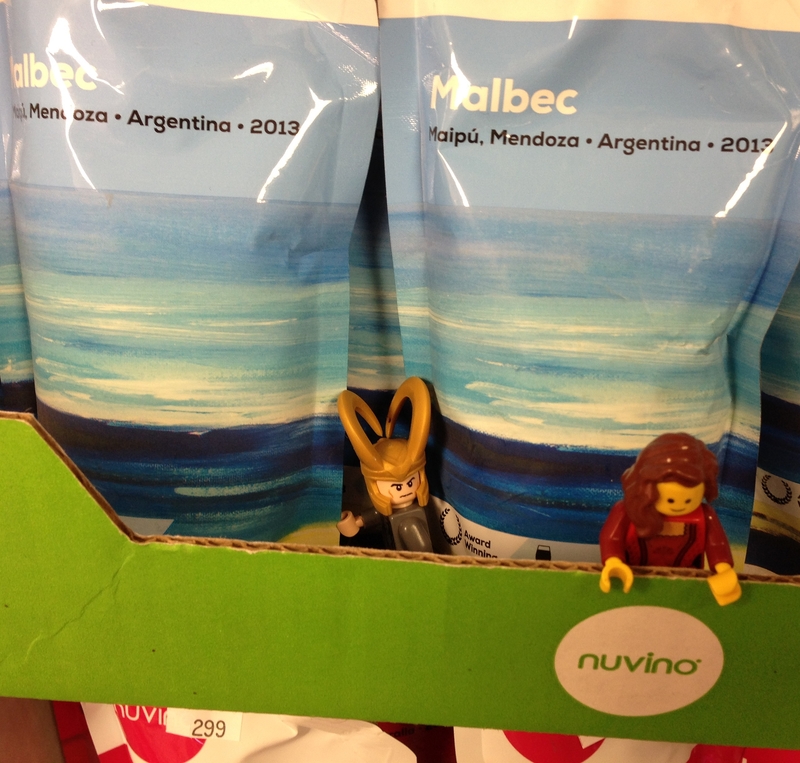 Wine pouches. Classy. As much as I could really use a good stiff drink, I think I will pass. Oh, joy. We’re all getting back in the car. More miles, fewer trees, more desert-y bushes, and bigger hills, some of which could generously be called small mountains. The human female has had a nap, done some more driving, and handed off to the male again. The sun is beginning to sink, though as we are proceeding westward at 80 mph, it it taking its own sweet time to reach the horizon. No, it is going to shine in straight into our eyes for as long as it possibly can. Another stop. 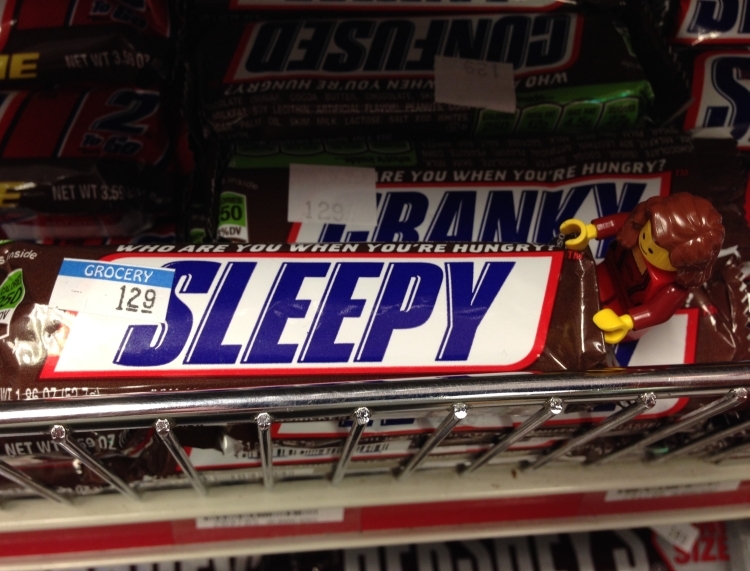 This little store sells candy with interrogative text on the wrappers. My love, who are you when you’re hungry? And look– they have one for me. It is fully dark now. There is a pale full moon peeking in the window, but no stars to speak of. In fact, some clouds are gathering, and I believe we will be rained upon before we reach our destination. This is the Chihuahuan desert, so of course I expected rain. 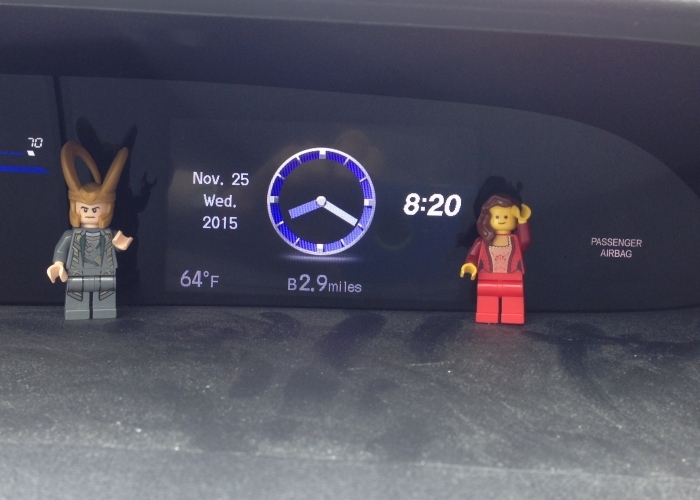 It’s the crazy sort of anomaly that makes sense when you have been in a car for about ten hours. 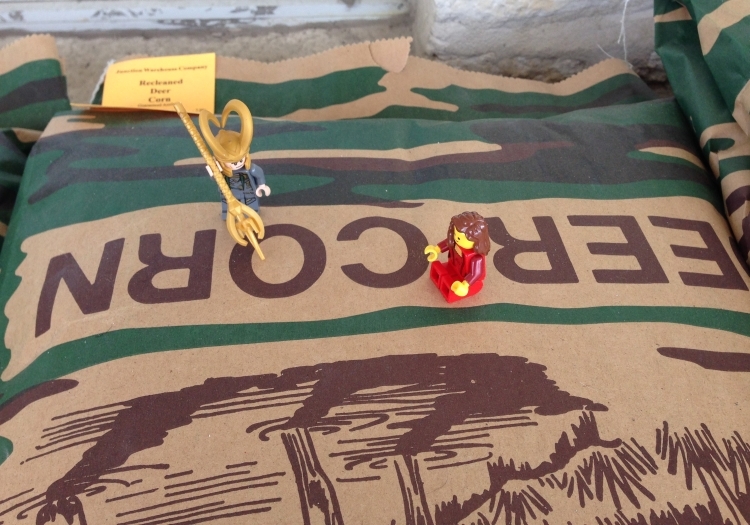 Sigyn, do you realize that we could have flown across the ocean in the time we have spent in the car today? And after this, our last stop, we still have two hours to go! 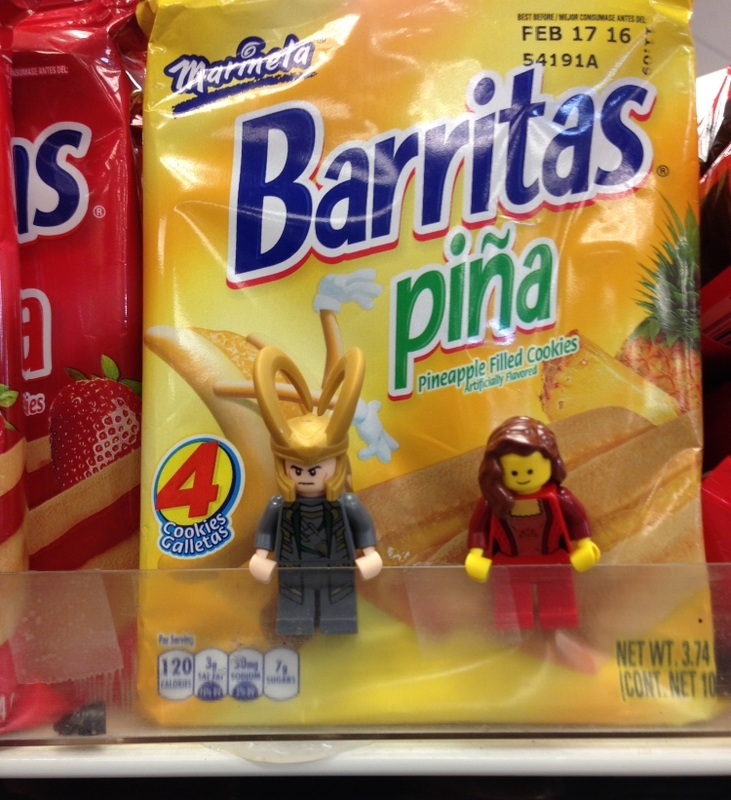 Let’s have one last look at strange Midgardian foodstuffs and drinkables. Aw, Sweetie, I love you too. It’s a hellish trip, but I’d go to the end of the galaxy and back if it would make you happy. Still later. Lights, open door, hugs, proper food, bed. We’re home. What Happened to all the Little Taters? What happened to all the little taters? 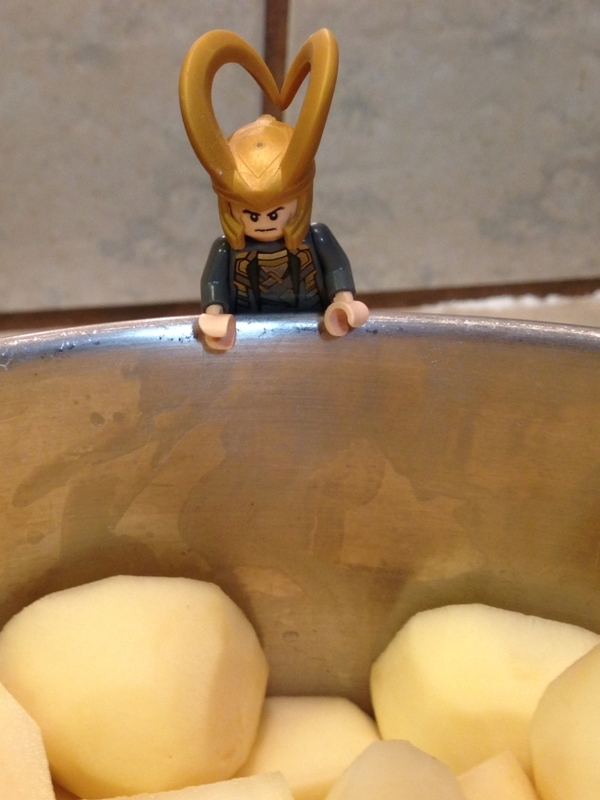 They were most cruelly boiled until they were tender and ripe for the smashing, that’s what! Two big pots of them! Sigyn, my love! You’re up! You’ve luckily missed all the sharp parts of the process, and now the human female proposes to turn these bland chunks of spudly boringness into something a little more interesting. Look at the steam! 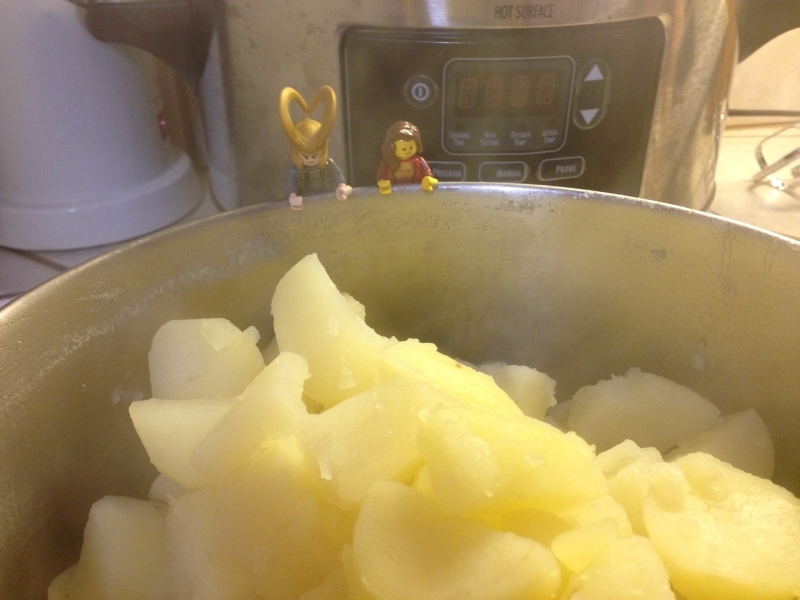 Careful, Sigyn, they are still very hot! 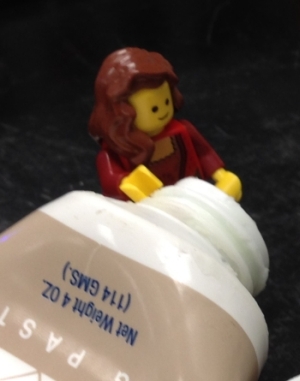 The human female says it is time for the other ingredients. Milk, parsley, minced onion, a bit of garlic, and an obscene amount of butter. Oh, and she’s got the mixer out! 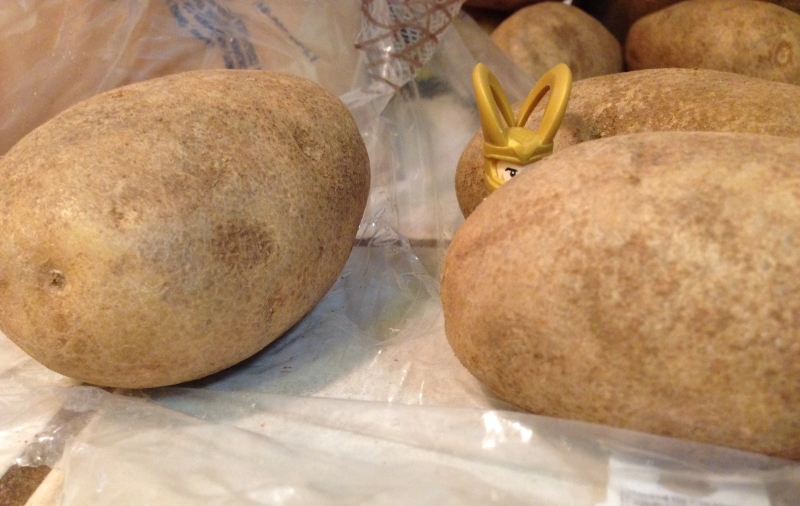 Those potatoes won’t know what hit them! Mmmm! I have to admit, they do look and smell pretty good. 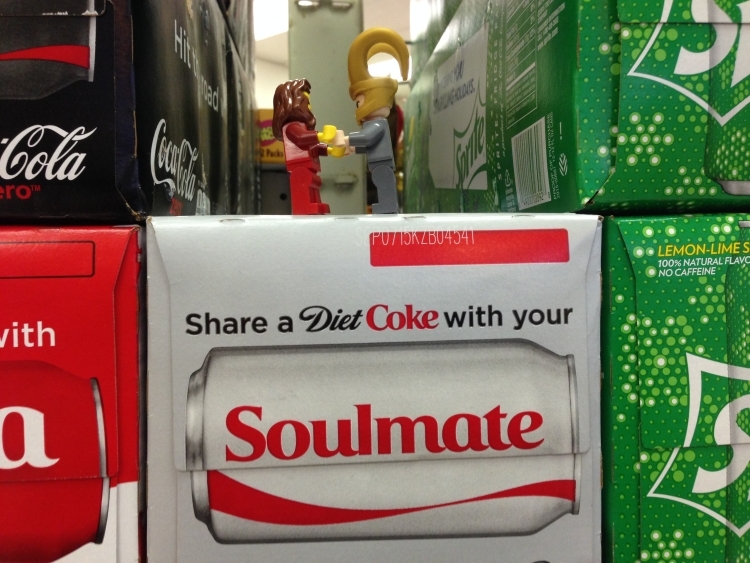 Do you now what we need now, Sigyn? I expect that the human female is going to spend a good part of today in a turkey coma, and then tomorrow, the humans are planning to travel all the way across this interminable state to visit her relatives and have another turkey coma. I may take a short hiatus from keeping this journal. 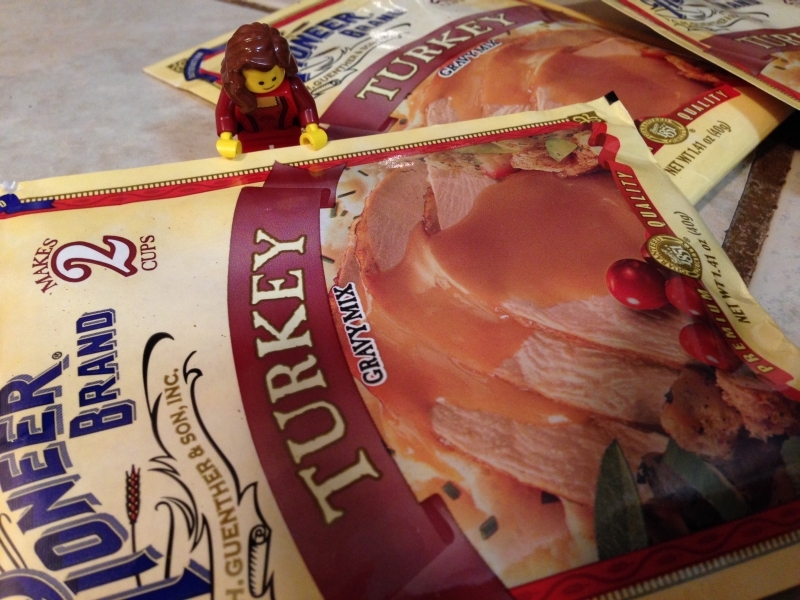 Sigyn and I are going along, and then I plan to do quite a lot of eating myself. The human female’s workgroup does something inexplicable every year at this time. As if the upcoming Eating Holiday weren’t enough, they all get together and have a little Potluck Eating Celebration all their own beforehand. 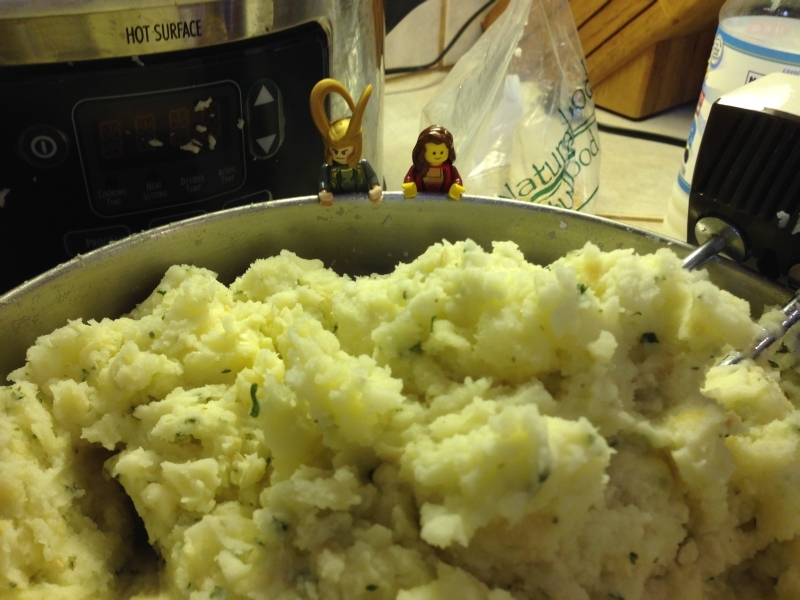 Volstagg would definitely appreciate what is essentially Gorging Practice. The human female has volunteered to contribute “Smashy Taters and Gravy.” No, really! 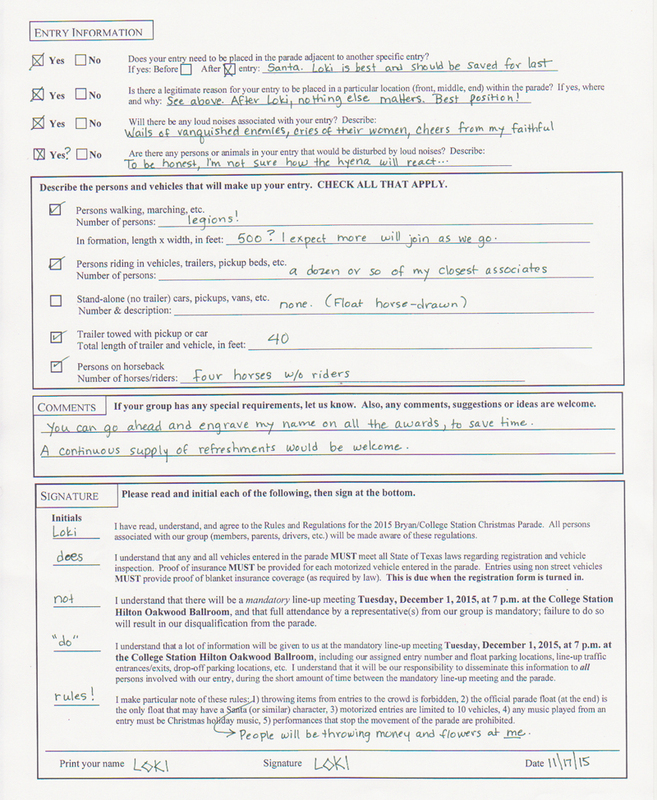 That’s what she wrote on the sign-up sheet. Knowing that she is a s-l-o-w chef at the best of times, she has wisely set her alarm for “sparrow fart” (again, her words) and risen much too soon after going to bed, in order to have time to work through multiple pounds of potatoes. 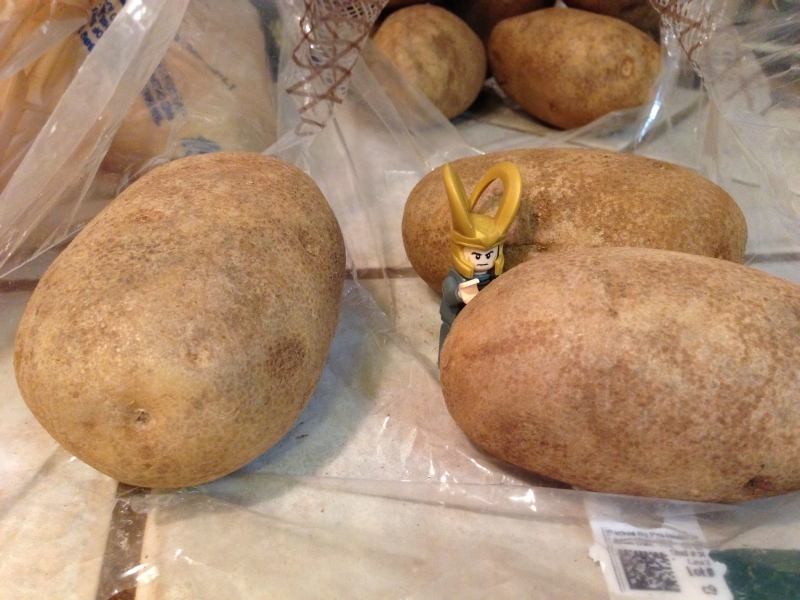 (poke, poke, poke) The potato is certainly an undistinguished-looking vegetable! She says this is something called a “Russet,” but how one is supposed to tell one variety of lumpy brown tuber from another I have no idea. Gods have better things to do than bother about such Solanaceous trivialities. 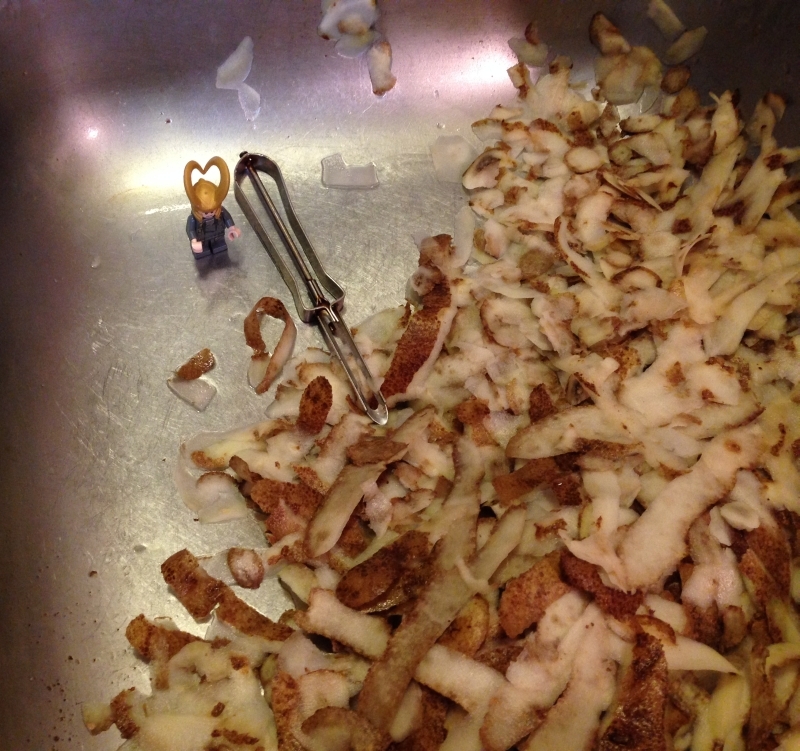 The first task, after washing all the potatoes, is to peel them. Of course, I could do it all at once in a flash of magnificence and magic, but menial work is good for the human female. It builds character. 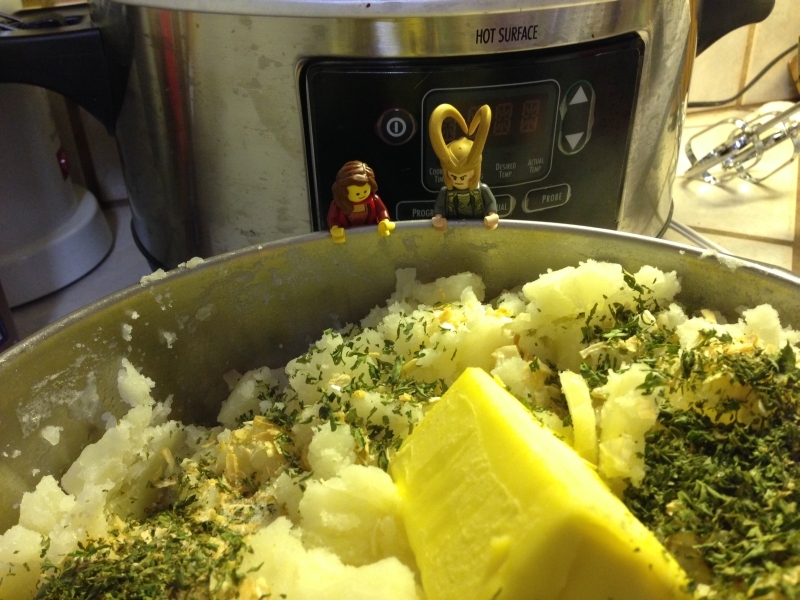 Now we must cut up the potatoes. I do not really trust the human female with sharp things this early in the morning, so it is a VERY good thing that Sigyn is still asnooze. 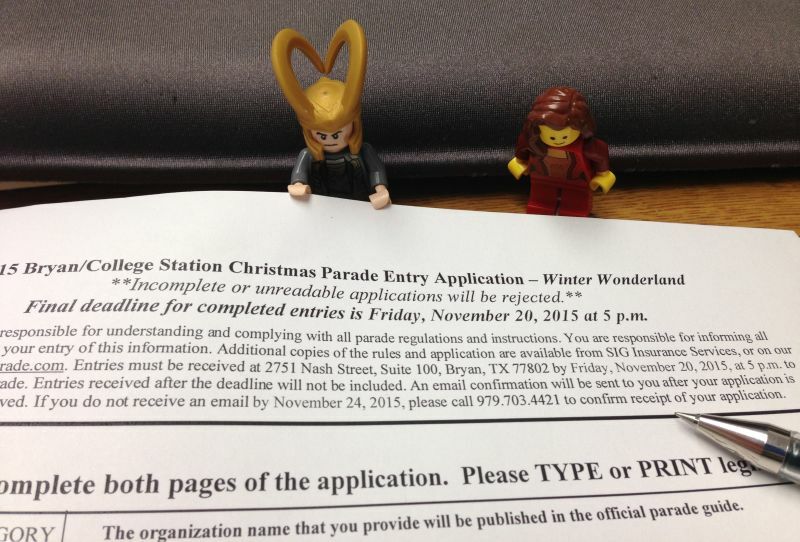 Apparently the Midgardian holiday season is upon us. I’m not always sure which holiday, because they all seem to run together. The Eating Holiday decor showed up before the Extorting Candy Holiday, and the Shopping Holiday items were in the stores before that. 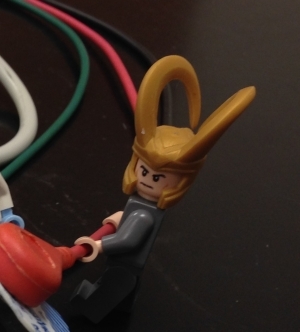 I don’t take much notice of most Midgardian customs, finding them tedious and beneath my notice, but I have found one that I think I can turn to my advantage. Good thing I have nice penmanship. Oops. Some confusion about surname, there. Let’s hope they don’t notice. I shall press on. 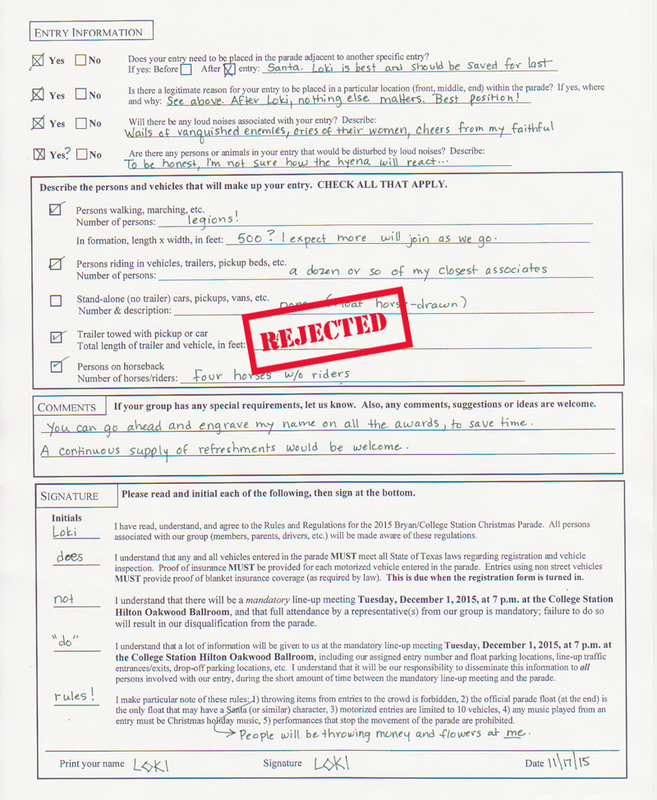 That’s the end of the application. 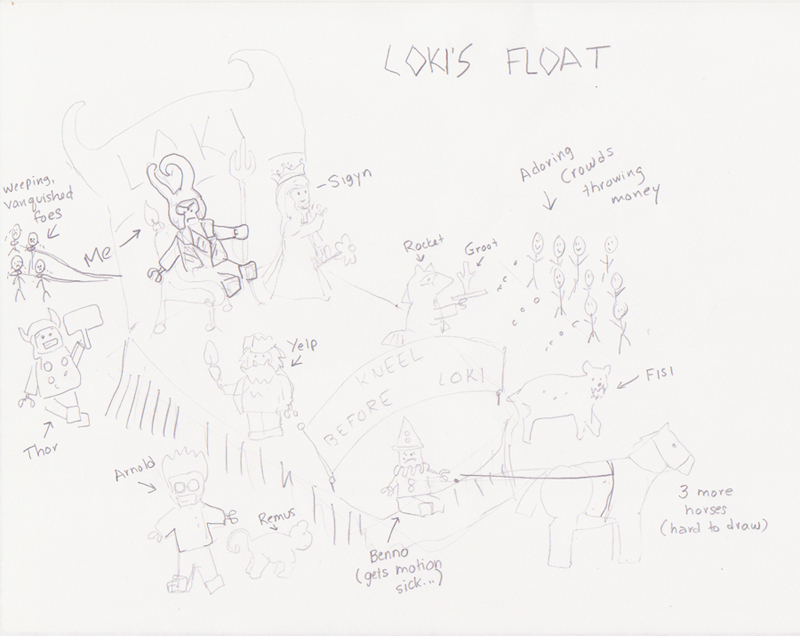 They didn’t ask for a sketch of the float, but it couldn’t hurt to provide one. 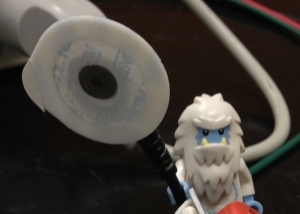 It’s rough–Sigyn is the artist in the family, not I.
I hope this Santa Claus fellow doesn’t mind being upstaged! The last activity of the Nervous System Lab is an examination of brain waves*, otherwise known as an electro-encephalo-somethingorother. It’s a many-stepped and exacting procedure, involving a power lab unit, a computer, cables, electrodes, electrode goo, and–what might be difficult to find among humans–a functional brain. Case in point: the human female offered herself as a demonstration subject during the Teaching Assistant meeting, and the device registered precisely nothing. Nevertheless, the students will be busy all week, slathering their classmates with gel and rigging them up. 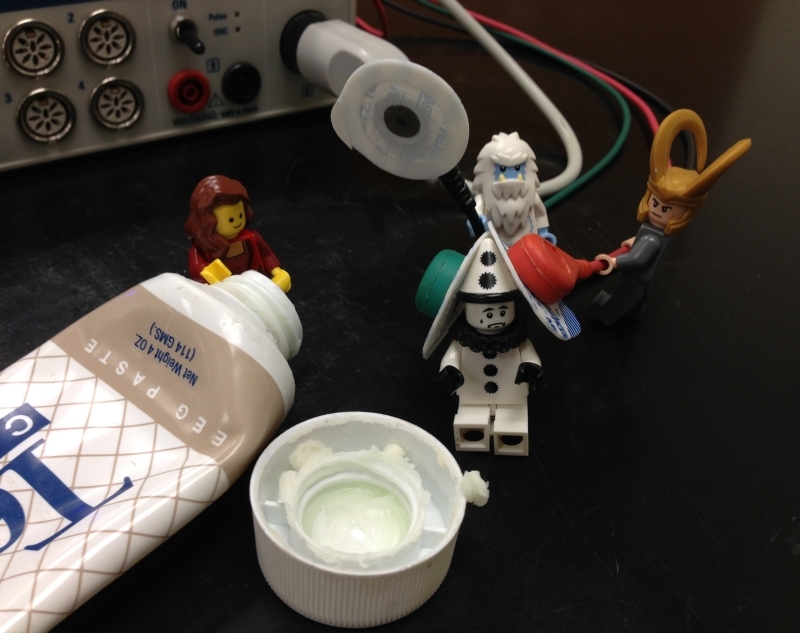 Sigyn and Yelp and I have formed an enthusiastic lab group and are eager to start. However, not all “volunteers” are pleased to be a part of Science. *I was somewhat disappointed to learn that all the fearsome-looking equipment is used to measure the electricity coming out of the brain. I was hoping we were going to get to sit people down and put some zaps in. I would almost pay to see that. 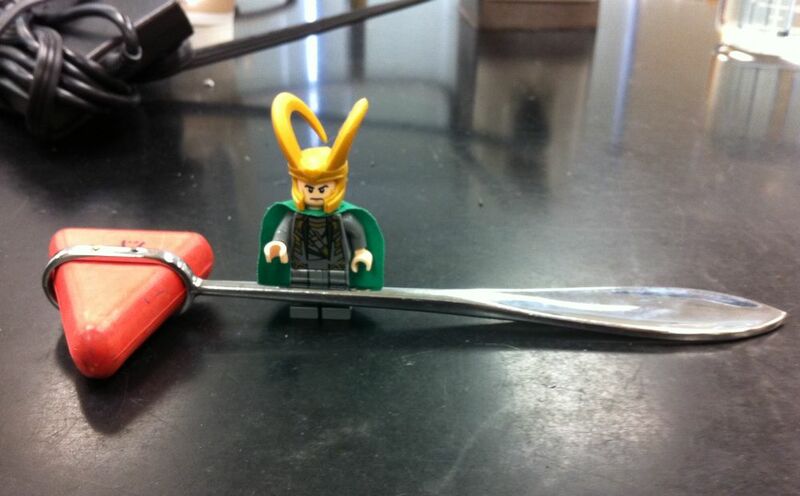 You are no longer the only one with a magnificent hammer, and mine is bigger than yours. Its name is Reflex and none shall stand against it! Let the smitings commence!